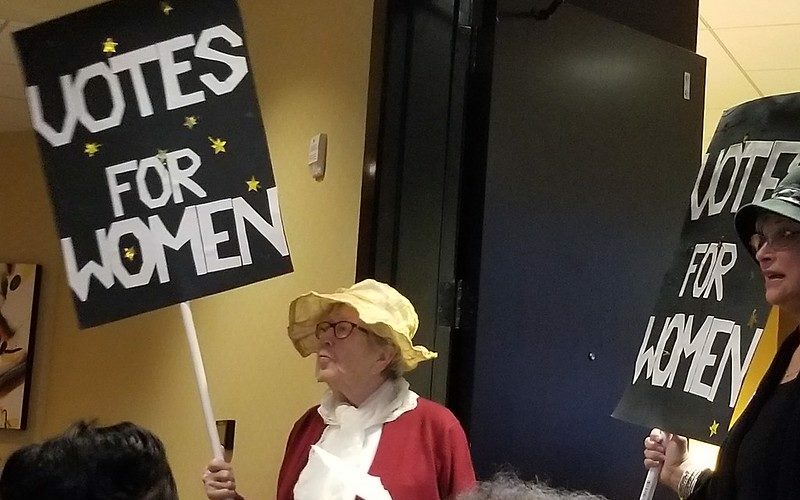 On Friday evening after dinner we had 3 women (Sue Metz, Mary Peterson, and Wendy Haner) put on their suffragette outfits and perform a Watchfire play. Sue wrote this and she was the narrator of the words of the suffragettes. Mary and Wendy acted out the importance of women getting the right to vote. The audience participated along with having an opportunity to voice their thoughts as to the importance of the Watchfire demonstrations. It all begun on New Year’s Day, 1919, a fire was lit in an urn in front of the White House and all the women began throwing copies of speeches in to feed it. The date was in honor of Joan of Arc: “the history of Joan of Arc is the history of women and government throughout the ages of the world”. All women who must obey the laws should have a voice in making them, and that those who must pay taxes should have a vote as to the size of the tax and the way it shall be spent. Because the moral, educational, and humane legislation desired by women would be gotten more easily if women had votes. Because laws unjust to women would be amended more quickly. Because disfranchisement helps to keep wages down. Because equal suffrage would increase the proportion of educated voters. Because it would increase the proportion of native-born voters. Vote NO on Women Suffrage because 90% of the women either do not want it, or don’t care. Because it can be of no benefit commensurate with the additional expensed involved. Because it is unwise to risk the good we already have for the evil, which may occur. We continued to burn the fire in the urn and protest until finally, on August 26, 1920, the 19th Amendment to the Constitution was ratified. And on November 2nd of that year, more than 8 million women across the United States voted in elections for the first time.